The Australian continent stretches northward into the tropics and southward into the path of the rain-bearing westerlies, encompassing habitats as diverse as rainforest, heathland, and desert. An astonishing 20,000 species of vascular plants exist there, the vast majority of which occur nowhere else in the world. Shrubs are the dominant plant feature throughout, and indeed Australia is known as "the world's great shrubland." 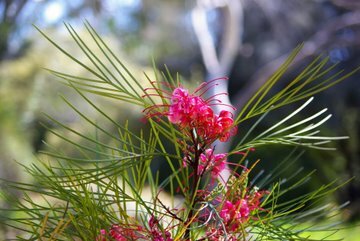 The Garden's outstanding Australian collection celebrates the beauty and diversity of these shrubs, and with over 2,000 species, forms, and cultivars is the largest collection of these plants outside of their homeland, impressing even Australians. With the growing need in California for beautiful yet drought- and pest-tolerant ornamentals, the Elvenia J. Slosson Research Gardens were established in 1978. At that time nearly all of the finest of Australian plants were unavailable to Californians since most of the Australian natives used in gardens had reached here by seed. With its mild climate, the Arboretum & Botanic Garden was the ideal site in which to conduct trials. 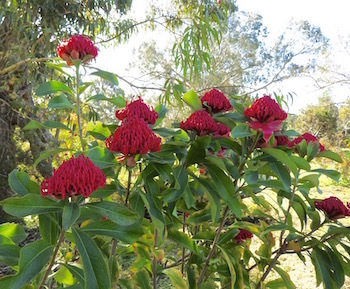 Since then, through the Koala Blooms Program, the Garden has tested several hundred, many of which have been introduced to the public and the nursery trade, changing the face of California gardens forever. Learn more..
A stroll through the Australian Gardens is always a feast for the senses. In the springtime, let yourself be enveloped in a haze of yellow flowers belonging to one of the many acacias (or wattles), members of the populous Pea Family. After a rain, follow your nose and you will undoubtedly be led to one of the many members of the fragrant Myrtle Family, which contains the well-known genera Eucalyptus, Callistemon, Melaleuca, and Leptospermum. You can't help but notice the spectacular members of the ancient Protea Family: Diving, glittering hummingbirds signal the presence of grevilleas of every form and hue; what might look like furry animals hidden here and there in the shrubbery are actually banksias; and those spectacular crimson globes are the waratah, whose botanical name, Telopea speciosissima, roughly translates as "most spectacular object seen from afar." Indeed, every turn of the path reveals a new combination of delights, so take some time to soak it all in and bring a camera! 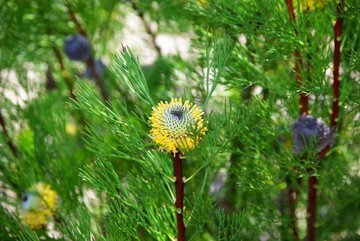 Learn about banksias from Melinda Kralj, Australian Garden curator, and the Outback Howlers.